I love buying stocking fillers. As much as it’s lovely to receive a big gift at Christmas it’s also so nice to have little but meaningful gifts to unwrap as well – and so I spend a lot of time choosing stocking fillers for everyone and so I thought it would be nice to put together some ideas of stocking fillers for the whole family – and they are mostly under £10 too – stocking filler prices! You can’t forget the youngest members of the family when looking for stocking fillers. Toddlers and young children will love a Magicube starter set in their stocking. With four magnetic cubes that easily fit together this would be a building dream for young children – and the start of a whole Magicube collection. A toy that even babies will love is this beautifully made Wooden Bus from the Museum of London Shop that will be played with and treasured for years. It’s so well made, durable and a toy that can be played with in so many ways – and will look beautiful on a shelf in the playroom too. One thing we always have in our stockings are Itty Bittys – the cutest plush collectibles. This year they have a great new Winnie the Pooh range that children of all ages will love – and even adults too. They are so like the much loved characters they are based on and would make wonderful companions for any child. Young children will love Teletubbies and Twirlywoos gifts – and there are so many of them around! From this beautiful Teletubbies nursery cot coil play plush to the Igglepiggle clip on toy or a Twirlywoos Christmas book – there are character stocking fillers perfect for every child. You are never too young to start reading and Hello, Farm is chew proof, rip proof, non-toxic and 100% washable book. Zoom! Beep! Vroom! Busy Cities has sturdy pages and features fire engines, diggers, motorcycles, boats, police cars, airplanes and prams in the park – the perfect books for even the youngest of readers. For a more practical present, this set of Hungry Caterpillar Cutlery would make a really lovely gift. In a beautiful gift box and really well made to make it comfortable to hold, the set would be a lovely introduction to cutlery for toddlers that will be used for years. Even the youngest of recipients can enjoy their own toiletries this Christmas and Aveeno Baby have a fantastic range to choose from. Aveeno Baby have launched Aveeno Baby Dermexa cream and balm which are both really effective at soothing and moisturising babies skin, reducing irritation and keeping them happy for Christmas and beyond. Belo and Me have a lovely range of baby products and their non-slip, wipe clean placemat would be a really nice and practical gift for any baby or toddler. In two different designs and a variety of colours it would be a great addition to any meal time – and something parents will really thank you for too! Another great stocking filler from Belo and Me is a Belo teething bunny. BPA free, 100% safe and also in a range of colours this bunny is the perfect shape for teething babies to hold and would make a really thoughtful gift this Christmas. Water Babies have a really lovely range of swim aids and toys that would make really lovely stocking fillers from birth upwards. The toys are fantastic for use when swimming but would also be great in the bath and each comes in a handy storage bag. You can see their full range here. Children absolutely love stocking fillers and there is just so much choice. There are so many pocket money toys of a blind bag style around at the moment like Lock Stars, Lost Kitties and Toy and Me Pop Surprise. They are the perfect stocking fillers, are collectible and contain fantastic surprises that children will love. Gift in a Tin have so many stocking filler options and I know their Jokes in a Tin would be appreciated by so many children – it’s the kind of humour that LP and Little Man absolutely love at the moment and with all the jokes in a neat little tin it can be stored away safely to be played with for years. Another option when it comes to childish humour is the Fartist Club toys. You pull their finger and they fart – with a whole range of realistic noises too. With different characters to collect children will no doubt find these hilarious. Following the fart theme takes me to Stink Bomz, a range of plush collectibles with a fart theme! Each Stink has their own silly smell and makes unique fart noises which children of all ages will love. I know these would be such an amusing addition to stockings this year. The Gruffalo is such a much loved character and there’s a great range of Gruffalo toys and merchandise on the market – all of which would make fantastic stocking fillers. One of my favourite things to buy children is a simple Memory game – and with a Gruffalo theme every child would love to play this classic game. Any sport or superhero loving child will love an Avengers Infinity War Scriball from Mitre. Mitre are the world’s original football and with a brand new range inspired by Marvel Super Heroes a Scriball would be a great addition to any stocking. Pick their favourite superhero and they can then create a football that is completely personalised, colouring it in however they like and then having years of fun using the football afterwards. Crafts are always a great stocking filler option for children and I know so many children would love a Magic Jar Kit. Including everything needed to make a So Glow DIY Magic Mood Jar – just add Water! With four ‘Moods’ to collect, the light up jar with colour changing LED would make a wonderful gift. For a gift that will be played with for years you could get the Jungle Animal Dominoes from JoJo Maman Bebe. Dominoes are such a timeless classic and children will love this set – full of bright and bold jungle characters and well made to make it perfect for little hands to enjoy. Finger puppets are another timeless gift and a set from Fiesta Crafts would be well received this Christmas. Well made and with so much character these finger puppets are set to inspire imaginations and be at the heart of so many stories and games. Fuzzy Felt is something that I remember loving as a child and John Adams have a whole new range that a new generation will play with for hours. In this Space themed fuzzy felt set children can create scenes and play out stories that are only limited by their own imaginations. Tractor Ted also have a great range of gifts that would make wonderful stocking filler additions for any tractor fan. With two new books – Tractor Time and Digger Time – as well as toys and drinks cups there is something for everyone. The Beaker Creatures range from Learning Resources would make a great gift – and a Reactor Pod would be a lovely stocking filler. They can be used by themselves or with the rest of the Beaker Creature range which we reviewed earlier in the year. They combine the amazement of learning through science with the anticipation of surprise collectibles. Toiletries are always a go-to stocking filler for us for the whole family and Perfume Click have a great range of toiletries for children from individual bubble baths to full gift sets which would make a lovely stocking filler. A practical idea for children would be a personalised money box like this one from GiftPup. Inspire children to save their pocket money for something they really want. This is so well made and something children will love to have on the side in their bedroom. All children need a hair brush and the great range from Tangle Angel have a brush for everyone – even adults. With a lovely angel design in a variety of colours they would make a really lovely gift this Christmas – whether it’s a Tangle Cherub or a Baby Angel keyring brush. Children love to create, draw and show their artistic talents so a notebook and personalised pencil set from GiftPup is bound to be a wonderful gift – and the perfect size for a stocking. This is a gift that I know children will treasure – taking time to fill every page. Craft sets are always something children love and Belo and Me have really lovely Superhero and Daydreams Craft Packs that would make a great gift for any child. Packed full of activities from making masks and wrist bands to lolly stick characters and games. This is a gift that will really keep children entertained over the festive season and long after. A creative gift that children of all ages will love is Paint Sticks from Little Brian. Painting can often be really messy but paint sticks make it so much more appealing and accesible, reducing the mess and making painting enjoyable for children and parents alike. These would make a really lovely stocking filler. A stocking filler that the whole family can really enjoy is Presto Snow Powder. Presto Snow Powder expands to thirty times it’s original volume magically making fluffy white snow. It doesn’t melt and lasts for days – bringing a white Christmas right to you. A current craze amongst children is slime and Zimpli Kids have just the range of products to make any slime loving child happy. With Slime Baff, Gelli Baff and SnoBall Play they have great value products that would make a really lovely stocking filler. What child would love to have a bath full of slime or jelly? Or the ability to make their very own snowballs all year round! I always buy books as stocking fillers and A Big Cheer for Wayne Dear is such a lovely option for the festive season. Created by Sophie Morrell who already have a beautiful range of cards and gifts, the book is full of lovable characters and a story that children can really get into and enjoy. A Big Cheer for Wayne Dear is an uplifting and tender story of courage and determination about family, friendship and togetherness. It’s written in rhyming couplets which really help to keep children engaged and it has a subtle mixture of dry humour and a twist at the end. It’s the perfect length for a bedtime story and a really lovely stocking filler. Plus, I’m giving away a copy on my Facebook page too. For a personalised option, Santa Socks is a beautiful book that would be enjoyed year after year. Complete with a main character that looks just like the recipient and even a photo of them, it’s a book that children will automatically love. After all, who wouldn’t want to star in their own Christmas story? Santa Socks is the latest release from Bang on Books and we were lucky enough to review their other two books earlier this year. Santa Socks lets children join the North Pole elves on a Christmas adventure where the main character – the child you create the book for – saves the day. This is a really lovely Christmas book and such a wonderful Christmas gift too. 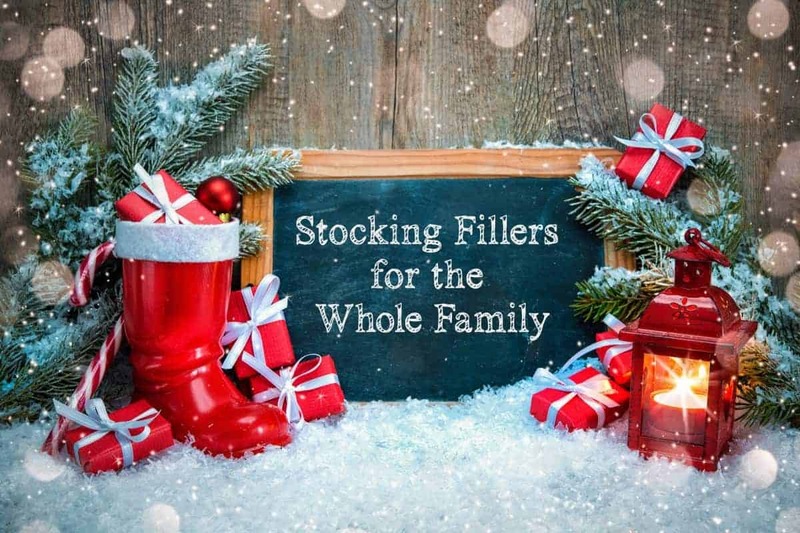 There are so many stocking fillers that adults can enjoy – and quite a lot of these are suitable for younger people too. Stocking fillers for grown ups give a real opportunity to play to their interests or give them something random that you know they would never buy themselves but would really love – just like Doughnut Socks from Sous Chef! So much fun and a real Christmas novelty but something anyone would love on their feet. Sous Chef also have a Grow Your Own Cactus Eggling that would make a great stocking filler for any member of the family. Growing something of your own is always so satisfying and having it pop out of an egg shell gives it a real novelty factor – and makes it look fantastic on a window ledge too. Another gift anyone in the family will enjoy is a Wondercake. Available in a range of styles and complete with a sparkler, this tasty sponge cake in a tin is something anyone would love to find in their stocking. Isabella & Us have a really lovely range of gifts that are designed to help the transition into parenthood, helping parents to celebrate the small wins and promote positive wellbeing in parents. A copy of The Positive Wellbeing Zine for Mums would be a lovely stocking filler. It’s a quarterly print publication of all things motherhood and positive wellbeing and is so much more than just a magazine, offering inspiration, information and relaxation for mums. A great token gift from their range would be a Winning as a Mummy/Daddy badge from their range of badges and enamel pins. They can be bought with any year on them and are such lovely gifts that any parent would appreciate – and you can see the full Isabella & Us range here. If you’re looking for a stocking filler that will really lift someone’s spirit then a pack of Royal Worcester Wrendale Motivational Quotes would be a really lovely gift. It includes twelve well made quote cards and a display stand in a gift box – a really inspiring gift this Christmas. A notebook is a staple stocking filler for me and I’m loving the range from Love Layla. With slogans to suit every personality – some more risqué than others – there really is a notebook to suit everyone and lots of other gifts too from mugs to coasters. Following on the stationery theme, Dairy Diary have a gorgeous pocket diary and notebook set that would make a really lovely stocking filler. This is the perfect set for quick and easy planning – and each book comes with a pen attached. Everyone loves stationery and a Jelly Belly Very Cherry Scented Stationery Set from Helix would make a great gift for someone of any age. It includes two pencils, an eraser, ruler, pencil sharpener and a four colour pen all in a jelly bean shaped metal tin. A really lovely and practical gift. Sugru is pretty much a household staple and their mouldable glue can be used for pretty much anything. Their kits would make a great Christmas gift. 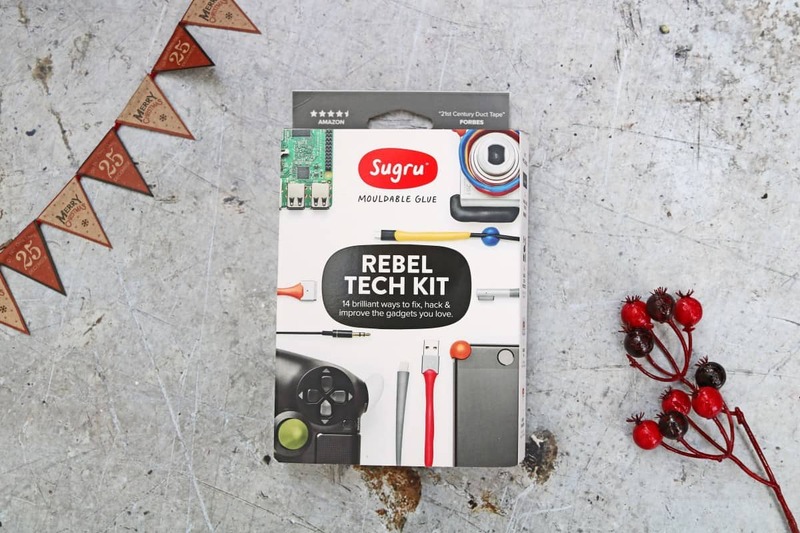 The Rebel Tech Kit has everything you need to fix broken tech or to make it work even better. The kit offers brilliant ways to fix, hack and improve the gadgets you love. Toiletries are always something I love to include in stockings and men shouldn’t be left out of that. Bulldog create a wide range of skincare for men and their moisturisers make a really lovely gift especially as they have products for every skin type. Another toiletry option is Perfume Click who have a really great range of gift sets for the whole family – with ones for men, women and even sets for teenagers and children. With perfumes, bath, shower and even skincare products there is a set that would be great for anyone. If you’re looking for vegan gifts this Christmas then Yaoh’s new skincare range would make a wonderful stocking filler. The range includes a new SPF-25 sunblock, a new Body Butter range as well as a number of new exotic flavours for Yaoh’s Lip Balms, Moisturisers, Shampoo, Shower Gel and Conditioner. Yaoh products are 100% vegan and are not tested on animals. Candles and home fragrances are another gift that are always high on my list when it comes to buying stocking fillers. This year Wax Lyical have a great range of candles – with festive candles and gorgeous alphabet votives amongst them. Colony also have a really beautiful range of reed diffusers which would fill any home with the fragrance of Christmas. For gifts that are a little bit different you could tae a look at Attitude Clothing. They have a wide selection of gifts and accessories that so many people would love – from Star Wars and Coffee pins to lip gloss and unicorn cups. They are so current, a bit alternative and a really lovely place for stocking fillers. Books are a great stocking filler and I love Baby Daze by Sarah Davis. It’s a collection of humorous and honest poems about early motherhood that any parent would be able to relate to – and it would prepare any expectant parent for life with their imminent arrival. Cancer Research UK have a really lovely range of festive gifts and homeware this year and a set of festive cake tins would be a really lovely stocking filler. Good sizes, hard wearing and a great addition to any kitchen at Christmas. They also have a range of Grow Your Own plant pots which have everything you need to grow different types of flowers – and come with a beautiful pot that matches the flower type too. I think any lady would love a Twist and Spritz Atomiser from The Fragrance Shop. Easy to fill and giving you the ability to take your favourite fragrance with you wherever you go it’s a stylish handbag necessity. The Harry Potter fan in your life would love some Harry Potter themed stocking fillers to unwrap and WOW! Stuff has a really great range to choose from. Keyrings are always great stocking fillers and any Harry Potter lover would appreciate a Lumos keyring with an LED light or a Sorting Hat keyring, complete with sound effects. Smellies are always something I love to include as a stocking filler and Sanctuary Spa are always top of my list. Their products work really well and smell amazing long after I’ve used them. This year Sanctuary Spa have a fantastic range of gifts including a Hands & Heels Pampering Duo and Must Have Minis – full of our favourite Sanctuary Spa products. A stocking filler that everyone can enjoy over the festive period would be Party Faces – hilarious party props for your face! With packs of novelty ears, eyes and even chins to add to your face I can see these being a huge hit at office parties throughout Christmas – and a great addition to any stocking too. Webbox have so many stocking fillers for pets from cat toys to baubles full of treats to packs of festive goodies and even Christmas dinner meals for cats and dogs too. You really can’t forget the furry members of your family at this time of year. Any chocolate fan would love to find a bar of Cox & Co in their stocking. Cox & Co is delicious single origin cacao that has been blended with superfood flavours to create a unique chocolate with both taste and sustainability at its heart. The bars come in four flavours – coconut and chia seed, bee pollen and honey, raw cacao nibs and single origin pure cacao. Alcohol is always a great stocking filler for the adults you’re buying for and MiniVino would be great in a stocking. Single servings of wine with red, white or rosé options, it’s the drink you can take anywhere with you. So convenient and perfect for the festive season. They’re available in Sainsburys and Ocado. My favourite treat that is top of my list of edible stocking fillers as a little indulgence is pretty much anything from Thomas Fudge’s. They are so moreish, perfect to share and really lovely to enjoy over the festive period. And there you have it – stocking filler ideas for every member of your family from birth upwards and not forgetting the furry members either. Do you have any go-to stocking fillers? It would be great to hear more ideas of what you would love to find in your stocking this Christmas.